Word sense disambiguation is one of the key tasks of text processing. It consists in the determination of senses of words or compound terms in accordance with the context where they were used. The word sense disambiguation problem originated in the 1950s as a subtask of machine translation. Since then, the great number of methods of its solution has been developed; however, none of them may be viewed as a perfect one. The paper is a survey of most well-known studies in this field. Original Russian Text © D.Yu. Turdakov, 2010, published in Programmirovanie, 2010, Vol. 36, No. 6. Kobritsov, B.P., Lyashevskaya, O.N., and Toldova, S.Yu., Verb Sense Disambiguation with the Use of Inflection Models Extracted from Digital Explanatory Dictionaries, Digital publication, http://download.yandex.ru/IMAT2007/kobricov.pdf.2007. 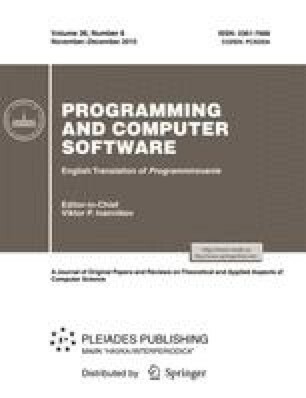 Lizorkin, D., Velikhov, P., Grinev, M., and Turdakov, D., Accuracy Estimate and Optimization Techniques for SimRank Computation, The VLDB J., 2009. http://dx.doi.org/10.1145/1453856.1453904.